Found Jimmy and two of three sisters sitting under awning between house and shop/garage, smoking cigarettes and drinking Old Milwaukee in red and white cans, a welcoming wave. Jimmy didn’t remember my name though I’m positive he remembered me. His sisters Dottie and Merle were friendly. Dot remembered me, Merle didn’t. Jimmy’s first question was, “What’s your problem?” or something to the effect of what kind of problem do you have? I had an old Stella guitar that belongs to my wife Susie, that was busted up with a few cracks in the top & open joint on the top & no bridge – the old one had snapped in two. I also had with me a fiddle belonging to Mark Haas. The fiddle was originally made in Columbus, but Mark got it in Missouri. Jimmy knew all about who made it and when they were around plus some details on their particular method of mass producing fiddles by “pressing the backs” into shape by use of a mold. He said they were OK, some “good, bad & worse” as he put it. So he hem-hawed around a bit as to which project he would take on, at first a bit hesitant to discuss the fiddle. A picture frame had dropped on it and cracked right through the top, though the fiddle was in the case at the time. It penetrated the case and all and left a nasty gash about 1″ by 1-1/2″ long. The thing that made Jim mad was the fact that none of the hardware was present: tuners, tail piece, etc. He kept complaining of having to deal with “busted tuners,” meaning unfitted pegs which would require shaping and fitting and an added expense for parts which I think was the main problem. He was proud of the fact that he was only going to charge about $30.00 to do the repair for the work, only not counting parts and strings. This made him very upset and was ready to not take on the job as a consequence. Though I knew he would if I played my cards right, which meant not being too pushy or impatient about when the projects would be completed. Somehow through word-of-mouth, probably from Cyrus McQueen, I’d heard that Jimmy not only was an incredible repairman, but quite an eccentric type who was extremely anti-social and maladjusted. These things tend to create a negative impression, but, to the contrary, Jim is actually a very nice fellow – a bit self-conscious of the fact that he’s a bit abnormal, for lack of a better term, though I honestly am not sure what normal means. But indeed Jimmy is a bit difficult to get acquainted with. One thing that is immediately obvious is that the man is extremely gifted musically and intellectually. A self-taught instrument repairman of unsurpassed skill. And quite knowledgeable about “real,” valuable fiddles of ancient European vintage. He once repaired for me a Russian violin, a “muley” he called it, my first exposure to the word and I was immediately overwhelmed by the thought. How great. But what he was actually referring to was the unique design feature that makes the Russian design stand apart from all the others – the edges of the fiddle top and back do not overlap as in most other types of fiddles where they stick out about 1/8 to 1/16 of an inch. Well in the muleys the top and back edges are “flush,” kind of rounded in, kind of giving the fiddle and interesting, almost streamlined appearance. I got the muley approximately December of 1978 while on Christmas break from OSU. Tom Smith had tipped me off on the whereabouts of a decent looking fiddle in an antique shop in Dublin, Ohio so I went and checked it out with Joe Kastor, an old buddy-musician friend. We had a few tokes of hashish and drove in the country and in downtown Columbus in my ’67 VW microbus. Well. the fiddle turned out to cost me $10.00. and she even threw in a couple hairless bows. I thought the wood was promising – nicely mottled, curly-maple back and sides, and I was real freaked to see another fiddle like I’d seen Bob Herring play in 1977 at the Glenville Festival. He was with Dave Molk, and I assumed it was some bizarre cosmic fiddle of unknown origin. Well actually muleys weren’t all that uncommon and not really considered a good make of fiddle. The one from Dublin was uncommonly good, and Jimmy was anxious to give it a go. I took it down the following spring. When I went to pick it up I realized I had an excellent instrument, thanks to Jim Wheeler. He repaired all the cracks in it, fitted new tuners, and refinished it – I suppose that was the most amazing part. Refinishing an old instrument is very risky, like trying to give somebody a face-lift without cutting his head off! You can easily damage the natural aged sound of the instrument, as the wood arranges its particles in response to the vibrations produced while being played. Well, Jim didn’t blow it – actually I think by setting it up and adjusting it he brought out sounds that weren’t even present in the first place. The tone was rich and clear and the intonation was accurate and easy to catch-hold of. So that was all I saw of Jim for quite a while. Then I broke my fiddle up again in Ireland. I dropped the “Muley” when I got off a train in a drunken stupor in Kilarney, County Kerry Ireland. I took it back to Jimmy later that summer of 1978 and he did an excellent repair once again. It was on the return trip that fall that I actually got to hear and play with him. I realized he was no ordinary run-of-the-mill Ohio fiddler. He was the real thing, a very bright creative unique style reminiscent of Buddy Thomas and Ed Haley, both of whom he knew, especially Buddy, whom he’d played with on several occasions. This is reflected in his style. I don’t think he actually made an effort to sound like Buddy, but in fact they are both representative of a regional style occurring in southern Ohio and northern Kentucky. Many of Jimmy’s tunes come from his father, Jim Wheeler, who was apparently a miller from points east of Portsmouth (more detail and background later). He plays very notey and fluidly, utilizing trills when they work. Kind of his own creative touch. Buddy Thomas and Ed Haley both used “trills” to enhance their sound. Jim also cited older area fiddlers as sources for some of the tunes, which led me to the conclusion that these tunes weren’t strictly Kentucky tunes but also were popular among Portsmouth area fiddlers of an earlier era. Acey “Aca” Neal was one of those fiddlers. 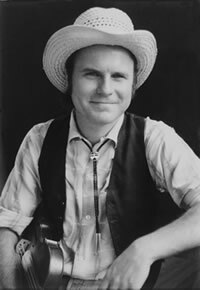 Many of the same tunes Jim learned from Acey were recorded by Buddy Thomas on his “Kitty Puss” record on Rounder: “Brown Button Shoes,” “Big Indian Hornpipe,” “Yellow Barber,” “Going Back to Ol’ Kentucky,” “Martha Campbell.” These were played by Jim’s dad too. I’m not real specific on which tunes were particular to each (more detail later). The tune “Blind Steer in the Mudhole” struck me as one of the most unique tunes he played the whole session. He learned the tune from his father. The first part of this tune was uncanny. I’ve never heard anything like it before. It starts out on the E chord, though the tune is actually, according to Jim, in the key of A. The second or “B” part of the tune is almost note-for-note derived from the Scottish, French-Canadian piece “Money Musk.” It kind of makes one ponder upon the origin or creation of fiddle tunes once again. The “A” part of “Blind Steer” is very bizarre and uncommon. I’m pretty sure I’ve not heard that particular melodic strain in anything else. The use of the open strings, double-stopping and drones is familiar to other pieces of earlier vintage. But that particular one is a first for me. Not that I’ve got that broad of a background anyways. Jimmy’s style in general sounds very French-Canadian, utilizing trills as ornaments, and “turns” too, as well as certain use of double stops and a kind of sharp broken choppy bowing simultaneously. This could and should be described more accurately with proper musical terminology. But it’s the best I can do for right now with my current degree of accumulated knowledge, self-learned perceptions and young viewpoint. It’s getting late and I’m groping for words, but want to discuss Jimmy’s mannerisms and personality – wacked out, that’s for sure. Who do I mean? Me or him? Both. probably. He was indeed a difficult man. Almost childish. Kind of sheltered, eccentric all the way, nervous, self-conscious, unpredictable, a bit evasive, or perhaps all this to become evasive because of fears. I often felt very intrusive and overbearing. He’d obviously shown some signs of being slightly unnerved at times by me and my insistence, and kind of goading and pleading for tunes, although I wasn’t as much as I usually am. I was firm with him because otherwise I would have gotten nowhere whatsoever. He certainly wasn’t going to volunteer to tape me some tunes. And was real hesitant about committing himself to doing a recording. I kind of had to march out and grab my recorder and tell him he would play! He refused, of course, as he showed me into his shop in the garage for a second round of tunes, this time for the machine. This was after a brief discussion about the record and how he wouldn’t take that one on, because I already had enough out of him with the guitar and fiddle repair. At first, when I mentioned the record, he said, “A fella would have to have a tape with him,” or something that implied he would make the recording there but not be coaxed into going anywhere else, either in a studio or anywhere but there. But when I called his bluff and said I had a good machine in the car, he immediately dismissed the idea and refused once again. Then again another bull and small talk and cigs. Finally I just headed out into the driveway and grabbed my gear which needed to come in from the sun and hot car anyway. He said no and I stood a firm yes. We headed in and he requested that I accompany him on guitar. I was actually pretty nervous once we actually got down to it myself. It’s as if we both realized the ultimate intensity capable, but also the fact that this was going with the recording so there was a bit of anxiety in regard to “getting it right” for the tape, which was actually a drag in a way and partly the reason I often haven’t recorded the most intense playing I’d ever heard, such as at Ward Jarvis’s and in Ireland and at other festival type events where music is occurring in spontaneous ways and the excitement is strictly for the sake of the enjoyment of sharing that moment. Perhaps as if it were a fragile magical experience whose existence depends on its flightfulness, the fact that a tune will magically appear in a certain form at a certain instance spontaneously based on the mood & temperament at the time. This sacred situation or moment can be greatly hampered when a recording machine is introduced – suddenly it’s recorded for eternity – held accountable for some reason that almost hampers the actual nature of the art. When people are participating in a beautiful and exciting session when the music is oh so grand, or ever listening, full attention and total appreciation, I feel as if it’s very unique to that moment and hope that there will be many more like it. So philosophically I guess I see eye-to-eye with Jim. Possibly, maybe he truly plays for self-enjoyment & for & with his friends who simply enjoy it for it’s own sake. This hero star business is weird – everything gets turned into a performance art, has to be documented, on display, gig, crowd, gallery, whatever. Is that what old time music was actually all about? I think, “Neh!” It’s back to that for-the-moment business! People used to just enjoy hearing fiddle music in a different way. Maybe they figured there would always be great fiddlers and tunes around, dances. But now it changed, people documenting this stuff because it’s been giving way to modernization and mainstreamization. But people are also into performing it and that I believe is different. A whole other animal, maybe. At least at a folk fest. there has always been a performance situation event, of course. Much solo fiddling in solitude I’m sure, but lots of social occasions for performing regional, local, familiar faces. No such an emphasis on analyzing and specifying that this is “folk, traditional Appalachian, whatever.” More on this later. This concludes Phase 1 for now. More of odd Jimmy Wheeler to come. When I complimented his playing (if you can), he said something to the effect of “fascinating yourself and fascinating other people.” That describes accurately his playing – fascinating. Very fascinating. He could also mimic the gimmicks used by more modern mainstream players, mockingly running through the bluegrass and fancy fiddle double shuffle lick like in “Orange Blossom Special” and many other tunes of that vintage and style. A common technique for sure. Who would you want to fascinate? Yourself or other people? Interesting questions for sure.